You won't see any difference in your cable bill right away -- but Charter might offer you new ways to access cable TV and the web in the future. Time Warner Cable's stock, which closed at $171.18 last Friday, was up about 4 percent on Tuesday morning. 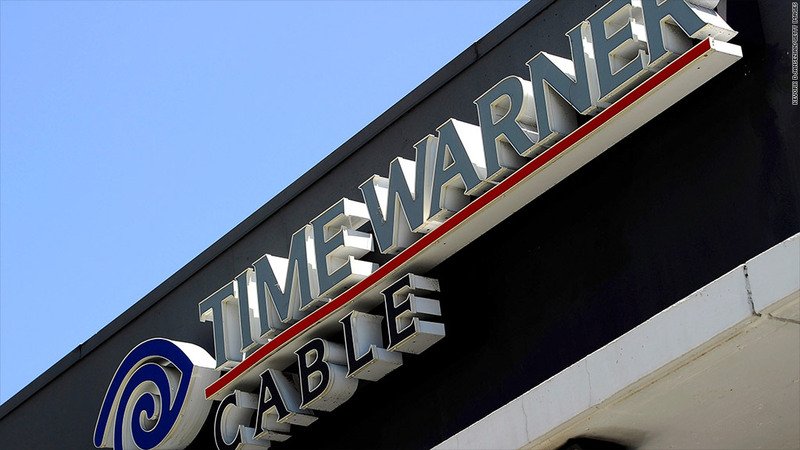 Charter will pay $195.71 per share, valuing Time Warner Cable at $78.7 billion. "With today's announcement, we have delivered on our commitment to maximizing shareholder value," Time Warner Cable CEO Rob Marcus said. Tom Rutledge, Charter's CEO, will run the enlarged company -- known in corporate-speak as "New Charter" -- and will receive a five-year contract extension. The deal is a climactic moment for Charter (CHTR), an under-the-radar company with operations in states like Michigan, Wisconsin, North Carolina, and Georgia. It is backed by the billionaire cable pioneer John Malone. But executives at Charter, Time Warner Cable (TWC)and Bright House say they have to band together. By getting bigger, they say, they'll be able to improve service and exert more influence over the future of television distribution. Charter's announcement on Tuesday specifically pledged faster broadband for subscribers; an improved cable TV interface; and wider availability of public Wifi. "Put simply, the scale of New Charter, along with the combined talents we can bring to bear, position us to deliver a communications future that will unleash the full power of the two-way, interactive cable network," Rutledge said in a statement. Some of the same rationales underpinned Comcast's bid for Time Warner Cable. But the government stood in the way of that deal, causing Comcast to abandon it last month. That's when Charter resumed its pursuit of Time Warner Cable -- a pursuit that began before Comcast (CCV) bid for the cable company. It sounds like the name Time Warner Cable will be retired: Charter already promotes its products with the brand name Spectrum, and it'll be extending that name to its new markets. Wifi is particularly important to the company. Rutledge told investors on Tuesday that "we will be expanding our wireless footprint," positioning Charter to offer a version of wireless phone service in the future. Will government agencies bless the merger? So why does Charter believe it'll win governmental approval when Comcast could not? Partly because it's not Comcast -- it's not already No. 1 in the industry and it doesn't own lots of cable channels the way Comcast does. On CNBC, Rutledge said that "we'll still be a relatively small company compared to the large phone companies, compared to Comcast, compared to the wireless companies." Rutledge and other executives expressed hope that the deal will be approved by the end of the year. Nevertheless, the industry analyst Craig Moffett said Tuesday that "one has to be sober about genuine risks that this deal could still be rejected." And the public interest group Free Press, which opposed Comcast's bid last year, said, "The issue of the cable industry's power to harm online video competition, which is what ultimately sank Comcast's consolidation plans, are very much at play in this deal." Marcus, the Time Warner Cable CEO, acknowledged the uncertainty in an email message to employees. "As we've all experienced first-hand, we have no way of predicting how long the regulatory approval will take," he wrote. "But we have every confidence the [Federal Communications Commission] and Department of Justice will begin their review quickly." Earlier this month, FCC chairman Tom Wheeler reached out to the CEOs of Time Warner Cable and Charter to say that "just because the FCC's staff wasn't convinced that the Comcast deals were in the public interest, they should not assume the agency is against any and all future cable deals," according to the Wall Street Journal. Wheeler issued a statement right after the Charter transaction was announced on Tuesday. "The FCC reviews every merger on its merits and determines whether it would be in the public interest," Wheeler said. "In applying the public interest test, an absence of harm is not sufficient. The Commission will look to see how American consumers would benefit if the deal were to be approved." Another industry merger -- between AT&T and DirecTV -- is also awaiting government approval. It does not appear to be imperiled the way the Comcast deal was. Comcast CEO Brian Roberts tipped his hat to his rivals on Tuesday, issuing a statement that said, "This deal makes all the sense in the world. I would like to congratulate all the parties."